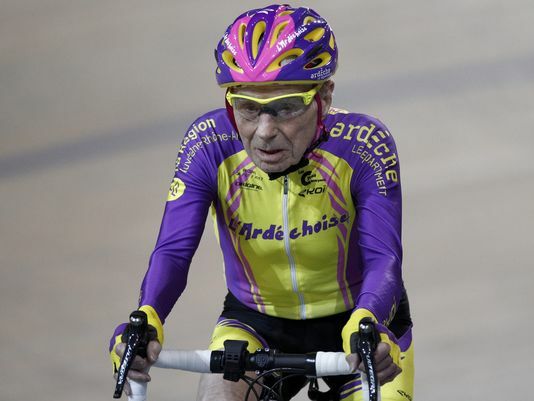 Frenchman Robert Marchand recently set a new world record in his age group for bicycling the greatest distance in an hour. His age group? 105 and over. Marchand doesn’t have much (any!?) competition in that age group. And the fact that he can go any distance at all on a bicycle is quite remarkable. In case you are wondering, the 5 feet, 115 pound athlete pedaled over 22 and a half kilometers in an hour. In appreciation of his feat, those in attendance gave him a standing ovation, and he was mobbed by dozens of cameramen and television crews. Stories of perseverance like this one motivate us to continue to do our very best. As long as we have breath in us, let us run the race of life with perseverance, keeping our eyes on the finish line and the prize that awaits us at the end of the journey. “I press on toward the goal to win the prize for which God has called me heavenward in Christ Jesus.”—Philippians 3:14. This entry was posted in Christian Living, Communion Meditations, Sports and tagged cycling record, Heaven, illustration, perseverance, Philippians 3:14, Robert Marchand, senior athlete, senior citizens. Bookmark the permalink.